I keep seeing people and articles asking the question “is local SEO dying” and I think it’s an absurd question. Local SEO won’t die as long as there are local businesses and users searching for those businesses on the internet, plain and simple. However, Local SEO is constantly changing thanks to our friends over at Google who are constantly finding new ways to keep businesses and marketers on their toes. Local SEO is nothing like it was 5 years ago, 1 year ago, or even just a few months ago because of these constant changes. While it has changed in many ways, there are also many ways it has remained the same. I am going to address some ways for businesses to remain competitive on Local search in this changing Local SEO ecosystem. Before I begin, I want to outline how Google determines local ranking. The primary ranking factors for local search are relevance, distance, and prominence. Google analyzes all of these factors to determine the results that are best suited for a particular query. Relevance refers to how well a local listing matches what the user is searching for. Ensuring that your listing and your site have the relevant information that users are searching for will help you compete on the relevance aspect. Distance is one aspect that SEO cannot effect. Google wants to ensure they are serving up results that are near the user, however, a business slightly farther away can outrank a closer business if they are outperforming in terms of relevance and prominence. Finally, prominence has to do with how “well-known” your business is offline and online. This aspect, like relevance, can be effected by the tactics outlined in the article. Local SEO is more dependent than ever on traditional SEO factors. In some of Google’s latest local updates involving the above ranking factors, traditional SEO signals have become a larger influence on local rankings. The better optimized your site is for SEO, the better it will perform in local SEO, obviously. What does this mean? Focus on improving page speed, keyword optimization within your content, link building, etc. Optimizing your meta data is both a local and traditional SEO tactic. For Local SEO, your metadata (meta titles and meta descriptions) play into the relevance aspect of local rankings. Your meta data should describe the content of your webpage and utilize the key terms that users are searching for. Because Google can determine distance, including geo specific terms is not as necessary as it once was, but you will want to conduct keyword research to determine the keywords that users in your target area are searching for to ensure they are included in your meta data. In my opinion, this is probably the most crucial aspect of local SEO. It is extremely important for local businesses to claim and optimize their Google My Business listings. If you want to show up in the Google local pack you MUST do this! Google is the leader in search so, plain and simple, it would be dumb not to ensure your local business is in their local directory. Your GMB listing should include a keyword rich description, relevant categories (you can have up to 5, use them all! ), business hours, phone number, photos, logo and accepted payment methods. Don’t leave anything blank, the more info you have the better. While most consumers use search engines to search for local businesses, it is also important for businesses to have a presence on non-search engine local directories. Remember that prominence thing I mentioned up above? Well, this is part of how you can affect that. Having a presence on all relevant directories will help expand your reach and make you more prominent across the web. Additionally, local listings on Yelp, Facebook, Trip Advisor, Yellow Pages, etc. tend to rank well in search and can help to improve the organic visibility for your business. Moz provides lists of top citation sources by city and also by industry category. Your business should absolutely have a presence on these sources. The more people are talking about you on the web, the more prominent your business is and the more people describe the services they received from your local business the more relevant Google believes you to be for future searchers. Reviews definitely play a part in local rankings and having positive reviews online also helps increase users trust your business. Your business should make an effort to gain reviews and should also be monitoring reviews and responding to both positive and negative reviews. By trying to address the issues in a negative review, your business will find areas of improvement, but also this gives you the opportunity of turning around a negative review and improving a negative experience. Google My Business, Facebook, and Yelp reviews are key players in the review landscape, but be sure to follow Yelp’s rules on gaining reviews so you aren’t penalized. Structured data are pieces of information about your website, business and content that are marked up to help search engines better understand them. The better search engines understand your business the better they can determine your relevance for a search. Google uses the structured markup on your site to build and improve the knowledge panel. The more info you markup on the site the richer your knowledge panel becomes. Google provides tools for testing your existing structured data as well as a tool to help you create simple structured data. There are many more tactics that you can employ to improve your local visibility, but the 5 above will have the greatest impact. Remember, as long as there are local businesses and the internet exists, people are going to be conducting local searches and you want your business to show up when they do. 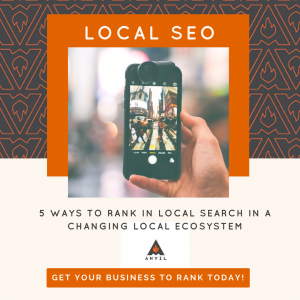 For more information and help with Local SEO, contact Anvil, as we would happy to talk with you about any questions or concerns.